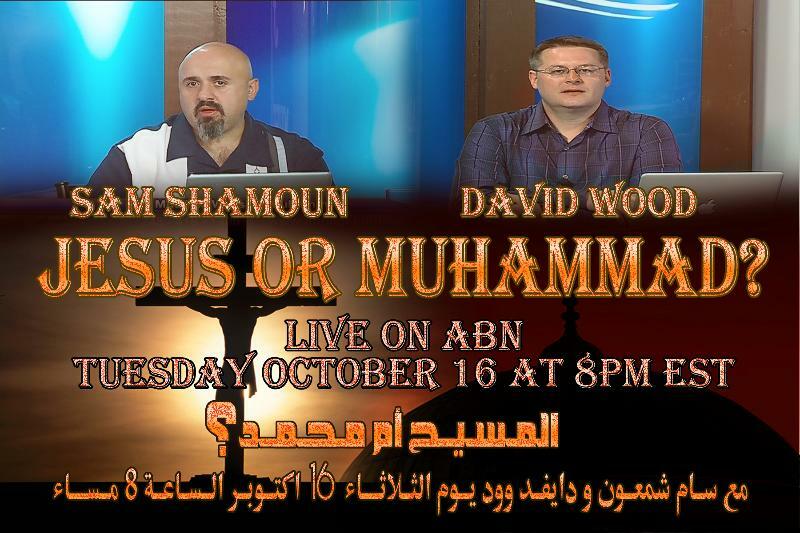 Be sure to tune in to ABN every Tuesday at 8:00 P.M. (EST) for the new season of "Jesus or Muhammad?" @David Wood This is probably the best news I've heard this week! I pray for this season that ABN with David Wood, Pastor Joseph, Sam Shamoun & others will bring many Muslims to the Truth of our Lord Jesus Christ. I also pray by the grace of God that ABN will continue to received funds this season so they can go on with this awesome show for many years to come in Jesus name, Amen! Looking forward to it as always. What a wonderful Blessed news, my dear brothers... Yes I pray for the abundance of Funding for ABN to continously have the funding for this awesome project, In Jesus Name, AMEN! With the financing issues of ABN, I wouldn't have thought that this would happen. I have started to contributed regularly; so, I hope that they have at least temporarily solved their financial issues. Everyone contribute what you can to ABN and pray for their needs--financial or otherwise. Is there any way I can watch on my iPad? I don't have a laptop with a flash player at home. financing can be solved if you just ask a coalition of churches to chip in. one thing about running raising funds i noticed in finance is that one tap of water can only to fill a bucket will only fill it faster slightly but even a trickle from multiple taps can flood the bucket. Great news. But how can i watch this in the UK? You can watch it live on ABN's website . . . unless you're asking how you can watch it when you'll probably be sleeping. In that case, you're on your own (though I might upload the episodes to YouTube). Could you also pass the message along to Pastor Joseph and ask if at all possible that news and views be uploaded more regularly, in fact all english spoken ABN shows, really like Jihad exposed with Samar Gorial, well worth watching as well. please help abn sat with their financial needs. i personally have donated my tiths please do the same and help them out. thanks brothers and sisters may christ guide us all. amen!